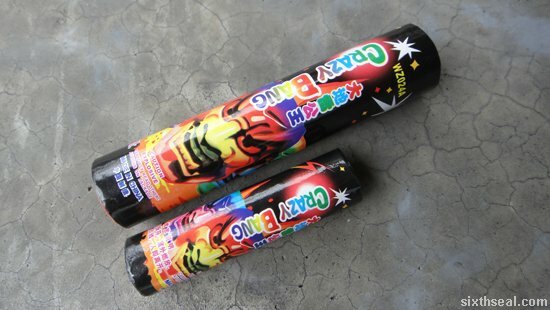 These two look similar (they even have the same name) but they’re actually very different firecrackers. 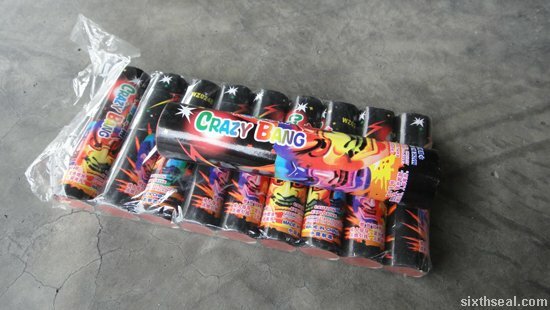 Crazy Bang is just a marketing moniker – a wrap around the salutes. 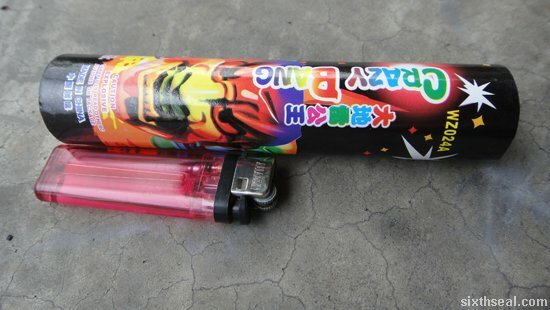 It doesn’t really mean anything – chai lei was called Pop Pop (the contact firecrackers kids play) one year. The large one is actually the original Thunder King while the smaller one is the new Thunder King. It’s a very “Luke, I am your father” moment. It’s really hard to find the old ones nowadays. 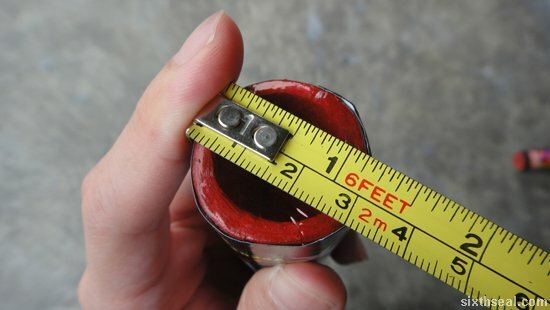 It has an OD (Outer Diameter) of more than 1 inch. 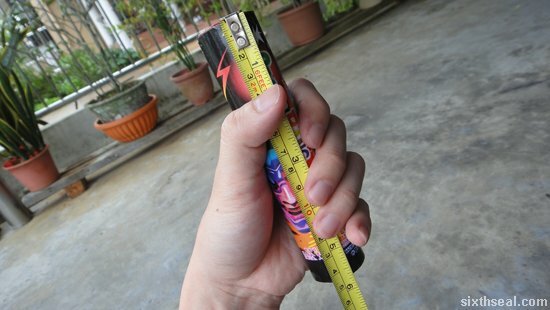 3 cm to be exact. It is almost half a foot long – 14.5 cm. Diameter of less than 1 inch – about 2.3 cm. You can’t really go much smaller than this for loud salutes. The length is nearly 4 inches. 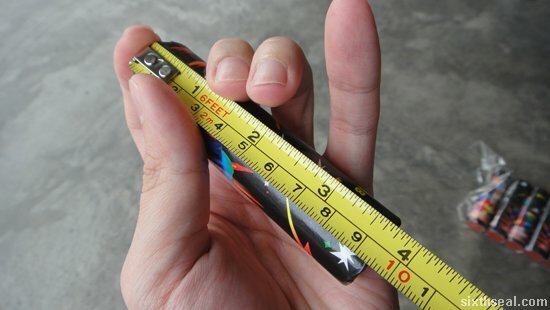 It’s 9.5 cm. Of course, the size doesn’t mean a thing – it’s the flash powder charge inside and how it’s constructed that determines how powerful and loud it is so I have here…a side by side test! I lit both of the Thunder King salutes within close proximity of each other (but not so close that the first blast will send the other firecracker flying) and recorded it while I stood in the middle. It sounds almost similar but the original Thunder King has more flash powder inside and you can actually feel the strength of the salute as it sends flying debris around. You can see that in the video. The originals are the bane of schools everywhere as kids tape it inside toilet cisterns with a time delay (usually a mosquito coil) and breaks it. There was one memorable year where the girl’s toilet had more ruined cisterns that needed replacing when I was in high school. I know the girl who did it. Heh. WAH LAO EHHH SO BIG!! The original Thunder Kings a.k.a. “da di lei gong wang” or “gigantic thunder emperor” so we just called it Thunder Kings are huge and loud and destructive. It’s half a foot by 1 inch. A firecracker of that size! I played this when i was in secondary school and I got scolded by my neighbour LOL. … i still have vivid memory of the sound… feels like the whole town can hear the loud boom! Well, it’s a good thing my neighbors are more tolerant. Haha! They let off heaps of firecrackers and fireworks too. Haha! Yeah, this was very popular in my high school too – especially the weeks leading up to CNY. They use it with a mosquito coil time delay to destroy the cisterns in the toilets. awesomeness here weh! :) Me likey. Yup, it’s perfection. I don’t know any other commercially available salutes which are as powerful as this. …and to be accurate, these aren’t even “commercially available”. HB. my uncle used to toss firecracker and fireworks into trash can to get the very loud sound from it. My grandfather almost beat him up for damaging a perfect good trash can. That when he was a kid. …but it depends on the thrash can – if it’s very contained with no opening e.g. the top, the explosion won’t have a “path of least resistance” and will blow it up. Yeah, even the small triangle firecrackers would do that. Haha! Well, amongst other things…the fireworks cakes produces *a lot* of debris too – cardboard, chalk, plastic etc. damn bro that’s crazy loud. 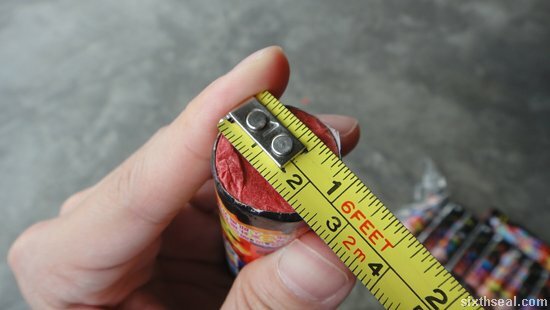 i’ve never seen a firecracker that big. it’s insane! It’s something I would not want to hold in my hand and I’ve had chai lei’s explode in my hand before. It just caused burns and numbness but I’m not sure it would be that mild with the original Thunder Kings. The older one got more blast! Yup! Definitely A LOT more powerful than the newer ones. Problem is the older, original Thunder Kings are really hard to get now. It’s not only illegal (all firecrackers are illegal anyway) but apparently it violates some kind of flash powder content limit on firecrackers. Guys guys relax, the loudest firecrackers are sold in East europe from countries such as the chech republic, poland etc…. These are Delova dana and big boy profi etc. If you want to look at some serious fireworks look up on youtube “illegaal vuurwerk compilatie 2013-2014” These people are nuts, its in dutch but based on just fireworks you will understand. Fireworks are a big deal in holland and every year the dutch citizens spend millions of euro’s on fireworks, it has become a real passion for many. Enjoy!